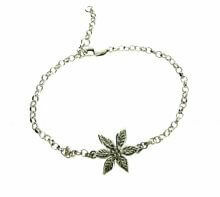 Pretty and delicate flower bracelet. The flower is approximately 2cm wide and the standard length of the diamond cut belcher chain is 45cm but can be adjusted to a smaller length. If you would like it larger than 45cm, please let us know. Delightful handmade sterling silver charm bracelet with little silver fish and a semi-precious gemstone drop. 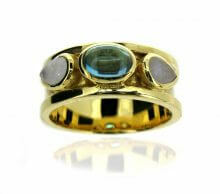 Choose from aquamarine, peridot, citrine or amethyst. This would make a perfect gift for any Piscean. The bracelet is a chunky cable chain and finished with a secure handmade t-bar catch. The bracelet is a standard 19cm long, please let us know if you require a different length. The fish and gemstone are approximately 2cm and 1cm in length. Please note that no two fishy charms are the same as they are all individually handmade. My wife was completely thrilled with the Bumble Bee Necklace and since receiving it has hardly taken it off. We are both impressed with the quality and workmanship of the piece and I am very happy with the cost - for a fine example of silversmith art. The necklace is so beautiful my friend hasn't taken it off since she received it and it came very speedily in plenty of time so thank you very much! Absolutely loved the brooch, the craftsmanship and design are superb and It's had many admiring glances. Many thanks. The ring arrived safely, size and fit perfect, it's totally gorgeous. Many thanks for my 'Memory Bracelet', it's perfect and I'm so enjoying wearing it. I've received the ring and it's gorgeous thank you so much.